You can find all the circuit ideas used in this project on the internet or in various books. It is only the way they are connected together that makes it different. This project was started to satisfy the need for a stable 2400 Mhz signal generator for testing antennas and down convertors for AO40 mode S. I tried all the normal oscillator - multiplier type of things, but all I seemed to achieve were things that had more spurii than I could deal with. 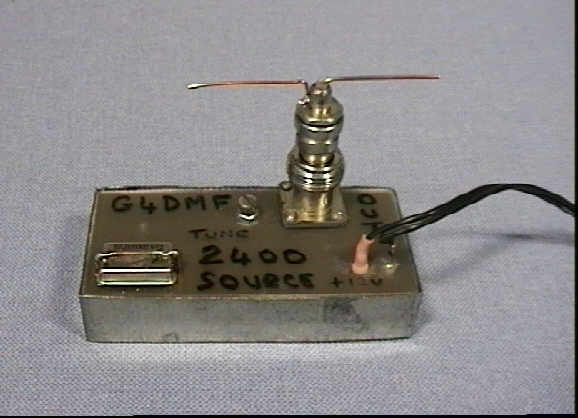 I looked around the internet, in my RSGB and ARRL handbooks, and came up with this simple generator. The output stripline section is from the RSGB Microwave Handbook. The total cost should not exceed £10 ( $15) even with all new parts, chances are that most of us can do a 'full kit' from our junk box. A well stocked " junk box " is still as vital a part of amateur radio as it's always been, perhaps even more so with the decline in component suppliers. 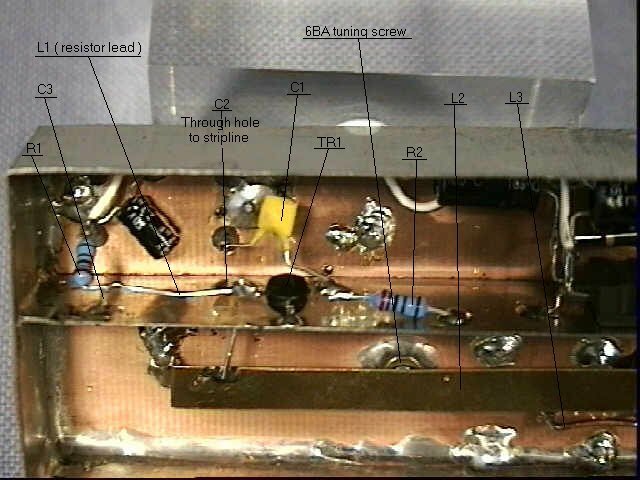 There are no critical components, not even the 50Mhz TTL oscilator block. It will work just as well with a 24Mhz block, and still generate a signal on 2400, but probably with not quite so much output. Below is the full circuit diagram, I think that everything that you need to know is there. L1 is the 100R resistor lead, the 1nF ( 1000pF) capacitor is soldered as close as possible to the resistor body, and straight down to the earth plane, you may use a seperate physical piece of wire if you wish, but why bother? The normal TTL decoupling techniques should be used, i.e. the 100uF and 10 nF caps are soldered as close as possible to the oscillator block. The whole unit is feed from a 12V supply and a 7805 regulator, I was'nt going to include the circuit for that bit as it is pretty obvious, but on second thoughts I have put a circuit for it, everyone is a newbie sometime, and obvious to me may not be obvious to someone else. Note the inclusion of a series 1N4001, the IDIOT diode, it is the FIRST component ever connected on my projects, because even after 30 years of construction, I still make errors and things can get connected reverse polarity, semiconductors are the ' fastest fuse on three legs ', and you rarely get a second chance! If your project is voltage critical, and you can't afford the .7V drop, then include a fuse and a reverse biased diode ACROSS the supply ( cathode to +ve ) the fuse must be INTERNAL to the unit, I usually use a .22R fusible resistor. When using lead-acid batteries for power supplies, because of the high currents that they can deliver, it is VITAL that a fuse is used as close as possible to the battery. The energy that a lead-acid battery is capable of giving, can and has in the past caused serious fire hazard. I run the whole thing from a 12V Dryfit battery, so I can put it at the bottom of the garden as far away as required. Don't try to set things up indoors, the reflected signals make it almost impossible to find focal points on dishes etc, I know, I tried!! When connected to a simple dipole antenna, using a Drake with minimal mod's and a 20 turn helix, the signal is a good S8-9 from 50 to 100 Metres. On my prototype, the BFR90 takes about 25mA, and has about 2.5V on its collector, so it is running 60 odd mW input as a 48 times multiplier, I have absolutely no idea what the actual power output level is, probably only microwatts, but it's suprising how far microwatts will go. On my unit the output frequency is only 10Khz or so high, which indicates that my 50Mhz block is only a few hundred hertz off frequency. The output tuned line can be altered for any other harmonic output frequency of the block. It should work OK on higher bands, perhaps with a transistor a bit 'hotter' than the BFR90 though. The whole project is constructed in the well known 'ugly' or 'dead bug' style, no effort was made make it look pleasing, after all it still works! The base plate is a piece of single sided fibre glass PCB, copper side in, the sides and divider are made from tinplate. The whole thing is seam soldered to make a rugged box. Ground connections are made to the nearest bit of earth plane available. An N type socket is mounted for the output. 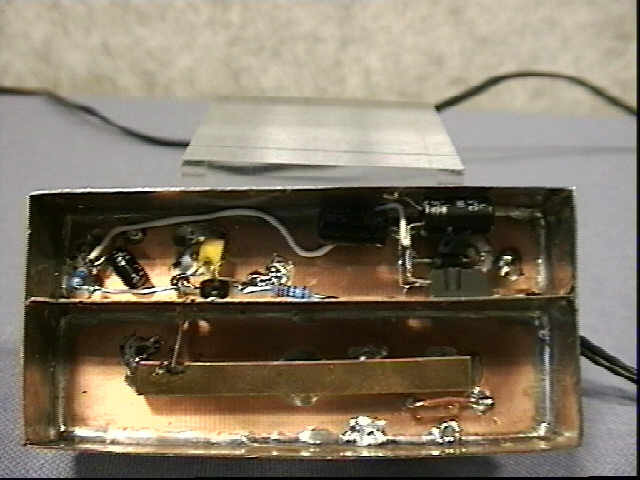 The oscillator block is mounted on the top side. with the pins going through holes in the PCB. I have put some pictures of the constructed unit at the end of this page.